Question: Whats the difference between these and the regular molotow aqua markers? 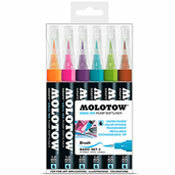 Answer: (AP Reply) Molotow Aqua Ink is a glycerin/ water based ink that comes in both markers. One is your traditional chisel marker while the other comes in a body similar to a paintbrush. This applicator allows you to use with water for more of a watercolor, dreamly look.